Cakespy Note: Yes, all of the photos in this feature are cakes, believe it or not! 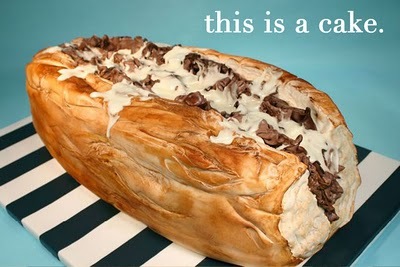 Cakespy: You studied fine art, but then took a little bit of a different turn and got a degree in Pastry Arts. Do you think your fine art background makes you approach Pastry arts differently? How so? 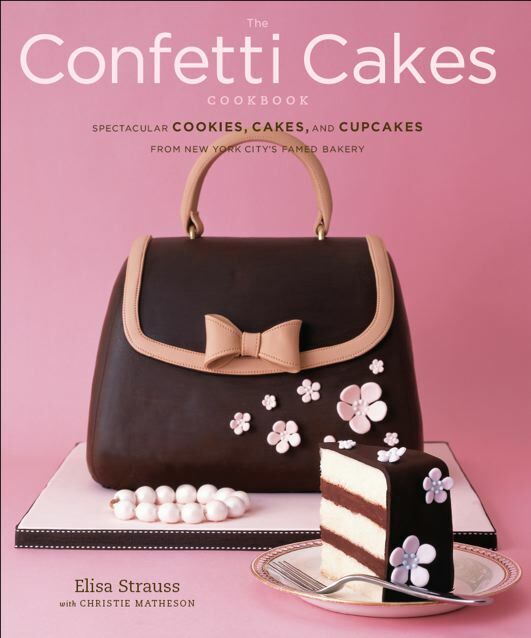 Elisa Strauss: My art background is a tremendous help when it comes to the cakes. It helps me with both color and design. Even though we make everything from scratch in the bakery, and consider taste the most important aspect of our cakes, I still look at each cake as a work of art too! CS: When did you decide to take on cake-making as your livelihood? ES: I had graduated pastry school and was back working in fashion full time (just making cakes on the side…very late at night) when about a year later I couldn’t keep the juggling act going anymore. I had to make a decision if I was going to go for it or not…so I went for it and opened a commercial space, bought equipment, hired employees and took it from there! CS: You work primarily in fondant icing. Do you ever work in other frosting or icing types? ES:We make all our fillings and frostings from scratch so we have a wide variety of flavors. From buttercreams to ganaches, citrus curds to fresh fruit, etc. We use a lot of different fillings in our cakes then frost them with a layer of buttercream that sits under the rolled fondant. The fondant gives the most elegant and professional look. You cannot achieve the detail we do with a solely buttercream frosted cake. CS: Do specialty cakes like yours really taste good? ES: YES!!! Absolutely. One of the most frequent compliments we receive is how AMAZING our cakes taste. People never think it is possible because our cakes look like realistic objects but they taste great. Again, we make all our cake and fillings from scratch with the highest quality and freshest ingredients we can find….we do not skimp on anything related to taste! Ever! 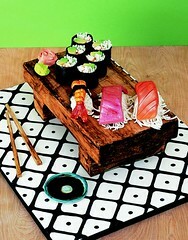 (Photo left, Sushi Cake, credit Alexandra Rowley). 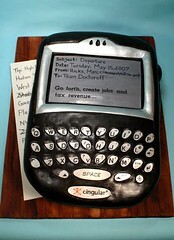 CS: You used to do cookies, petits fours and cupcakes, but have now pared down to just custom cakes. What made you decide to cut down on the other services? ES: I LOVE doing the smaller items, i.e., cupcakes, mini cakes, cookies, etc…but as a business model it just didn’t work. I could spend all day designing one cookie I could sell for $10 instead of working on one specialty cake for $800….you see what I mean? It just didn’t make sense for the business anymore. CS: Can you tell us a little bit more about how it feels to work in a commercial space versus, say, a cramped NYC kitchen? ES: After working in my TINY, TINY apt kitchen for a few years I thank my lucky stars I have a commercial space…I could never go back…especially with my 20 quart Hobart mixer! CS: Do you get nervous about baking on-screen? Yes! I definitely get nervous….especially with LIVE television anything can happen. The last time I went on the Today Show a light fixture crashed ten seconds before we went on the air…Ann Curry saved Al Roker and my cakes form getting hit by catching the light…and then all of a sudden three seconds and we were on LIVE National TV. I would say it is more of a “butterflies in my stomach” feeling of nervousness then scared! I love doing television! CS: What was it like to meet Martha Stewart? ES: Wow, amazing! It is so incredible to meet people who you see all the time…but on TV. She is such an incredible business woman! CS: About that famous Flaming Sock Monkey Cake. Did it get eaten afterward? ES: The last challenge on the Food Network: Extreme Cakes…was amazing! Not just because we won but the entire experience was incredible…SO much time and energy went into the planning and making of that show! Unfortunately by the time we finished it was close to MIDNIGHT and after all the photos were take it was thrown out because the studio had to get set up for the next day! 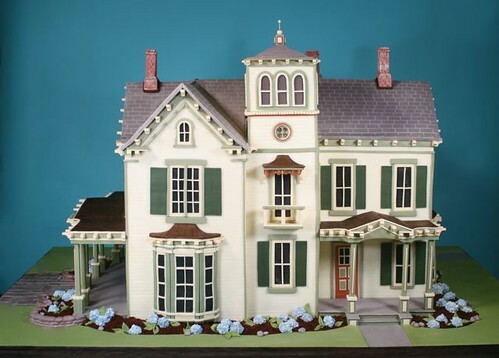 CS: All of your cakes are unusual and unexpected--but have there been any that have really stood out, or been special, for you? Well, each cake is like a child to me…I usually don’t forget any that I have EVER done! So it is hard to pick favorites…but I will say I am especially proud of a few cakes that stand out: a Victorian Mansion cake (photo left) we did for a couple’s wedding last summer. They got married at the House, and we even matched the paint chips for color! 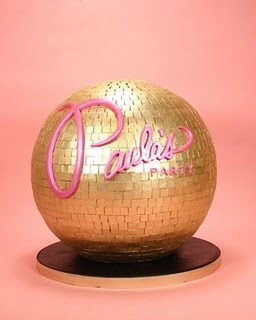 I also loved being on Paula Deen’s show, Paula’s Party (see photo above, by intro paragraph)…where we made her a disco ball cake for her disco themed party! [Also] I do love replicating food…so many of our sushi or Philly’s cheese steak cakes are fun! OK, there are a lot...but I will not go on! CS: How often do you eat cake? ES: Quality control is tough but someone has to do it…hee, hee! Not everyday but probably more then I should! CS: What are some of your favorite desserts? ES: I would definitely NOT put cake up there…..I am much more of a cookies and ice cream girl! Bread is my real downfall….but I love a good Buckeye ball or Key Lime Pie too! CS: Have you noticed any trends, or movements, in cakes and cake making in recent years (popular flavors, themes, or anything you've seen emerging)? ES: I love the fact that most of my clients have moved away from just a traditional cake….even in flavors. We do a ton of Red Velvet, Banana or even Coconut flavored cakes! CS: Which part of writing your book was hardest--making the cake "patterns" or finalizing the recipes? ES: By far the hardest things were: making all the cakes, cookies and cupcakes for one week of a photo shoot (we had to shut down doing other people’s cakes for months so we could just focus on making the projects for the books)….and then writing out STEP by STEP directions for EVERY aspect of each project! I really, really want people to be able to make everything at home so we labored over every detail, measurement, weight and direction! CS: To you, what is the most important aspect in making a great cake? ES: It should look and taste equally great! It also doesn’t hurt when people don’t know that our cakes are actual cakes! CS: What makes a "bad" cake? ES: One that doesn’t taste great. CS: If you could go back in time and give yourself any advice while just starting your cake business, what would you say? ES: “Don’t do it”…JUST KIDDING! Honestly, I do not know…I kind of just jumped right in, worked CONSTANTLY and I am still figuring it all out! Want to find out more? To make an appointment in their NYC studio (they will deliver throughout the tri-state area), or find out more about Elisa and her cakes, visit confetticakes.com. Want to buy the book? You won't regret it; it's like a cookbook and beautiful craft book all in one! The photos alone are worth the investment; it's available online here.